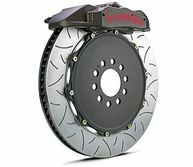 Brembo Brakes are the undisputed global leaders in the production of vehicle brake discs, calipers, and complete braking systems. With its unrivaled expertise, Brembo produces everything for the most popular﻿ cars in the European, American, and Japanese markets to braking systems for the world's most prestigious and exclusive models. Here at Euroworks in Calgary we provide only the best car brakes and are excited to be working with a manufacturer that has the most durable and reliable components to braking for the world's most popular and widely sold cars. 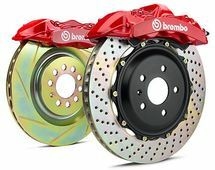 As Brembo brakes are a state-of-the-art braking system designed and produced specifically for the most exclusive and desirable models in every class; we at Euroworks in Calgary don't see why you wouldn't want to look in to these amazing products. Whether you're ripping down Deerfoot Trail or just doing a lot stop-and-start driving on 17th Ave SW, you always want to be assured you can stop quickly and powerfully when the time comes, right Calgary? Check out the awesome video at the bottom of this page and see these green Brembo brakes in action on a beautiful BMW M3!! Whether you are looking for brake pads, rotors, calipers, or a complete upgrade/Brembo Brake Kit, we can supply and install these parts for you at our Service Center. 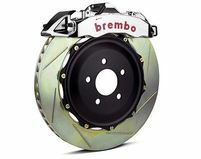 When replacing your brake parts, consider moving to a Brembo Brake System, which includes new Discs and Brake Pads. We would always recommend to use Genuine Brembo Parts, as there part reliability, durability and performance speaks for itself in the Automotive Industry. The Brembo GT High Performance Braking System Offers Significant Advantages over the OEM Braking Systems, advantages far beyond what's simply known as "Big Brakes."